The arrival of the Bianchi X4 frame, a 1988 version in need of some serious restoration work, to bring back the original celeste and chrome finishes. Just over two years ago a battered 1988 Bianchi Specialissima X4 frame arrived, well overdue for transformation back to it’s long lost, race-ready form. First the chrome finish was restored, followed by new paint and decals. While Joe Cosgrove and myself were finessing the celestial Bianchi paint, chrome and fine details, I was busy fishing around in obscure corners of the internet. Efforts to find 1980’s vintage Campagnolo, Weinmann, 3ttt, Alpina, Ambrosio, Look, Clement, Regina and Selle Italia components were met with denial at every step. Sounds familiar? The frame's refusal to comply at every step of it's restoration equalled the challenge thrown up in finding components to finish it with. Below is the image of the original 1987 Specialissima X4 Bianchi Piaggio team bike which I'd raced on. We based our reproduction of the original team bike around it's representation in this photograph. Here also is a matching photo of the finished 2015 version. The new version represents the bike in the same format as it was raced, so some changes to the pedals, an extra bidon cage and bar wrap ends received black electrical tape. Finding a new old stock, Weinmann Carrera 400 brake set, threw up a challenge that seemed impossible to crack. Using search terms in English proved to be fruitless, so when the search was conducted in German for “Weinmann Carrera 400 bremsen”, bingo, the Swiss goat farmer’s unassailable hoard of bicycle components appeared. There were two sets of Carrera brakes to choose from. Unfortunately for foreigners, during the decades our Swiss goat farmer was busy filling his barn to the roof with antique bicycle parts, he was also busy preparing a list of terms and conditions as long as War and Peace. The Swiss German Goat Farmer Proclamation of 2006, clearly stated that no foreigner was allowed to use a telephone, postal service nor computer to communicate with him. In no way would this keeper of goats and bike parts, talk to anyone who did not live within the cosy confines of the twenty six cantons of the Confederation of Helvetica. The irony of this struck me, as I used to live nearby at Sulgen and often rode the original Bianchi X4 team bike, right past this goat farmers door while training. What do you do when a problem like this crops up? You call Maulwurf, who lives in sunny Bettwiesen, not far from the goat farm, Maulwurf being Swiss, qualified as a prospect who may have some luck purchasing Weinmann Carrera 400 bremsen. First we had to fully read and check every detail in the Swiss German Goat Farmer Proclamation. Next Maulwurf jumped through some hoops which included interpreting the ten pages on “How to correctly setup an appointment and related protocols” section. Finally Maulwurf rode his bicycle to the goat farm, arrived at the appointed correct and true time, made the exchange and shipped the Carrera brake set to Australia. Even the grey Weinmann brake cables which were original on the team bike arrived in Australia, in a foreign land far away from the Swiss goat barn! The Selle Italia Super Turbo saddle. 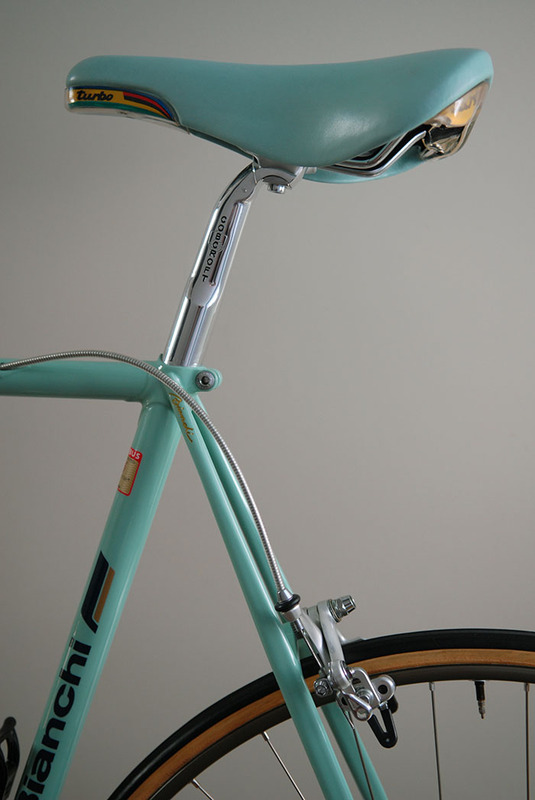 So you want a new celeste Bianchi saddle, one that doesn’t look like a sagging bridge on the point of collapse. In fact finding a Selle Italia Super Turbo saddle in any colour without cracked, plastic end parts, is near impossible, you just have to look sideways at a NOS saddle sitting in it’s box and the plastic will crack at the screw holes. Then if you can find a Super Turbo in the celeste Bianchi colour, with an intact plastic carcass and half decent end plastics, usually the celeste covering will have taken on a new form, it’s faded celeste colour now a scoured and wrinkled remnant. Bianchi Piaggio Weinmann Team Issue X4 the 1987 version compared to the 2015 Bianchi X4 replica. Robert Cobcroft, Bianchi Piaggio Weinmann 1987. 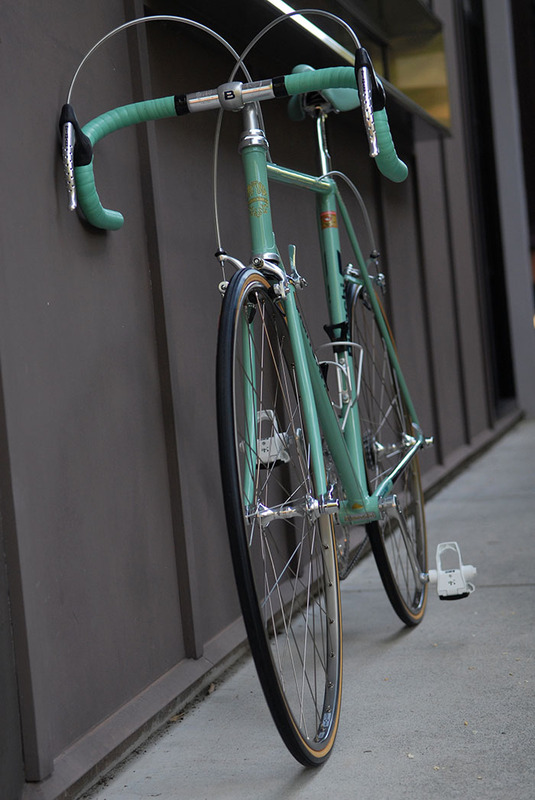 Bianchi X4 Specialissima race bike. I wanted this Bianchi team bike to represent the special attributes that Bianchi Reparto Corse had bestowed upon the original. A black new old stock Super Turbo saddle was found and sent to Busyman Bicycles for re-covering, together with a celeste hide that had taken weeks to track down. The first celeste cover proved to be a bit too turquoise-blue not celeste at all, then Mick from Busyman found an almost exact match for the original Bianchi celeste, so the saddle went back for a second re-covering. 3ttt Record LA 84 stem or AR84 Tracking down a mid 1980’s 3ttt stem that has the correct 3ttt engraved logo and Bianchi engraving is near impossible. In the mid 1980’s 3ttt updated their Record stem lineup and produced a handlebar stem named after the Los Angeles Olympic Games, hence these stems are sometimes referred to as Record LA 84. The 3ttt catalogue shows the model as AR84, meaning Attacco Record 84, using the Italian word for stem, Attacco (joint, connection, attachment, coupling) or in English - Record Stem 84.At the same time 3ttt updated their logo three times. The first was a more traditional re-vamping of 1970’s engraved logo, the engraved logo then received a contemporary look, followed by this logo being transformed into a print on the front of the stems. Most 3ttt stems available for sale are of the newest printed type from the 1990’s and wrong for a mid 80’s Bianchi. 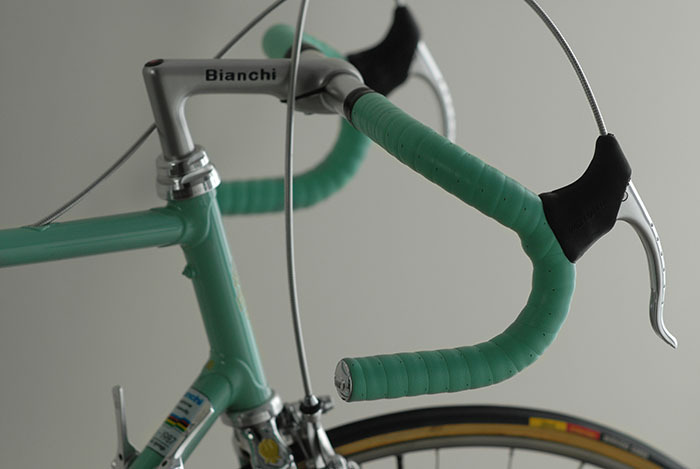 If you’re restoring a late 1980’s Bianchi X4, 1988 onwards, ITM bars and stems were fitted. Finding one of the engraved 3ttt logo stems with the correct clear anodising is no easy task. Typically parts are missing, including grub screws, rubber inserts and stem bolt end caps. First I began collecting 3ttt engraved stems which all were black anodised, the black stems seemed more readily available. Eventually enough grub screws, end caps and rubber inserts became available to make up some complete 3ttt engraved stems. Using heavy duty oven cleaner and a brush, the black anodising was removed, then the stems were polished. Then there were many months of trying to track down someone who could reliably pantograph on curved surfaces. A contact was found in Europe, another long wait. The design had to be established using Photoshop then sent to the the pantographer. After pantographing the stems were polished for a second time, returned to Australia and then anodised in clear. Using slow drying oil based model paint, thinners and fine brushes, the pantographed details were painted in. The right side NOS Campagnolo C Record friction shift lever and NOS Campagnolo C Record 180mm seat post were also pantographed then polished to retain their original finishes. 3ttt Competizione Tour de France bend 44 cm handlebars and 3ttt handlebar end caps. Both these items, bars and end caps proved to be relatively easy to find, compared to some of the components that were re-worked and restored. Ambrosio Bike Ribbon Bianchi Celeste coloured handlebar tape. The GS Bianchi Piaggio team bikes were originally fitted with Celeste Ambrosio Bike Ribbon. Another needle in a haystack search. After more than a year of sifting through endless listings for Ambrosio Bike Ribbon, part of the hide supplied to Mick at Busyman was cut up and Mick made some custom celeste bar tape, to look as close as possible to the original. Afterwards, two rolls of the original Ambrosio tape came up for sale, one of these is now installed on the bike and the leather version can be used on another project. Black electrical tape (pvc insulating tape) has been commonly used to finish bar tape ends for decades, so this remains true to the original bike. The factory built bike came with the Bike Ribbon promo end tape, but this was quickly changed on the original bike. Alpina Inox "A" head 14 gauge spokes. 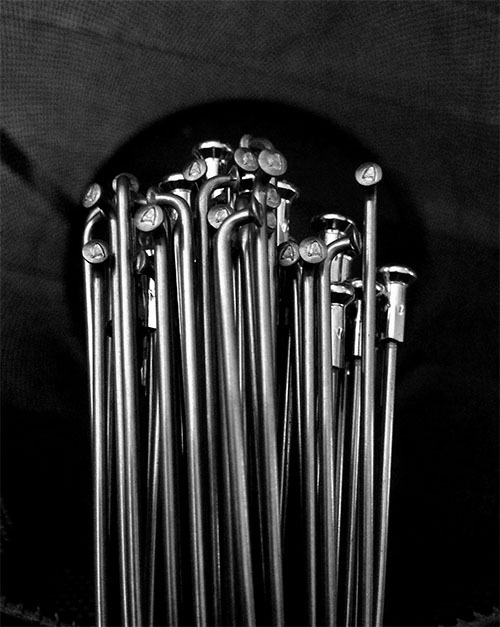 NOS 1980’s 14 Gauge Alpina Inox spokes. Try finding new old stock Alpina spokes in the right lengths! Then to find the right length before purchase, welcome to the world of effective rim diameters and spoke calculators. Another round of midnight oil burning sessions and enough genuine NOS 302 mm Alpina Inox spokes with the correct “A” head were found. To make the search more difficult, most of the available Alpina spokes are “S” Alpina’s. Steven at Craftworx wheel builders helped out with trimming the drive side spokes to length, then Ben Smith “The Collector” threw his hat in the ring and built up the wheels, the Alpina spokes being mated to NOS Weinmann Carrera 32H rims and NOS Campagnolo C Record low flange hubs. 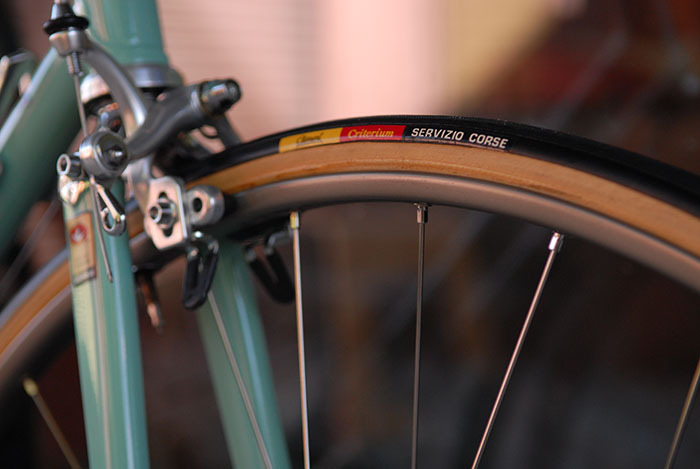 Clement Criterium Servizio Corse Production of Clement tyres began in France in 1888, eventually moved to Italy and a hundred years from it’s inception during the 1980’s, Clement was bought by Pirelli and production moved to Thailand. Finding old tyres in pristine NOS condition usually means finding some extra dollars, even if they are Thai made and not original Italian production that made Clement so famous. The New Old Stock Campagnolo C Record Rear Derailleur Where do you find an extremely rare Campagnolo C Record rear derailleur in new old stock condition, that has the correct Gen 1 derailleur cage cutouts. Almost nowhere, and then if one can be found, at what price! Getting my hands on the Clement tyres and the correct rear derailleur meant only one thing, so I headed down to the cross roads at midnight ........... There were three different versions of the Gen 1 Campagnolo C Record rear derailleur, one of the most desirable cycling collectables of all time. The most familiar of the three has a completely enclosed derailleur cage face plate. There’s a second version with a cut-out in the bottom half of the face plate, this style became standard on the Gen 2 Campagnolo C Record rear derailleur. The version that I eventually found for the X4 team bike was the third type with both top and bottom face plate cut-outs. This version looks more like a prototype Campagnolo derailleur with a shield engraved parallelogram. The Campagnolo Corsa Record front derailleur was one the easiest components to find. For more on this iconic derailleur I wrote a post about the complete history of the Campagnolo C Record front derailleur. Look PP65 Pedals. 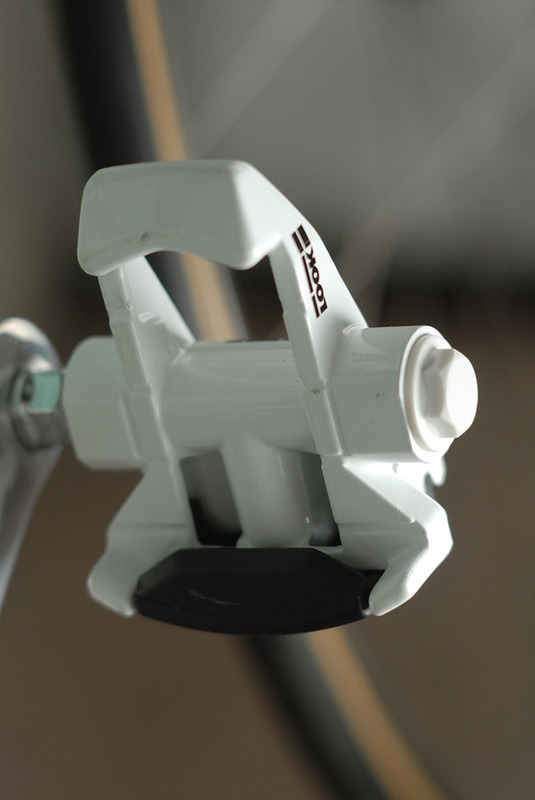 The original pedals supplied with the Bianchi X4 team bike were Campagnolo Corsa Record, these were immediately swapped out for Look PP65 white pedals, 1987 was the year when nearly every bike racer on the planet ditched toe straps and clips in favour of these new “safety” pedals, as they were called at the time. The ski binding company had set the trend with their new clipless pedal, changing cycle sport forever. When it came to finding a set of these pedals in NOS condition, they just appeared at a bargain basement price and I snapped them up. The easiest find by far on this build. Campagnolo C Record Gen 1 Crank Set 53/42 At the beginning of 1987 Campagnolo was still shipping 1st Gen C Record rear derailleurs with stamped - engraved shield logos, the transition had not been completed to Gen 2 derailleurs. Though the matching cranksets now had printed shield logos. I’d missed this subtle detail when searching for the cranks. I vaguely remembered the crank set having a shield printed logo, and recently I made a 1,200 dpi scan of the original bike photo and sure enough, the cranks were issued in January 1987 with a printed shield logo, yet the derailleur was Gen 1. Obviously it wasn’t long after that the Gen 2 printed logo rear derailleur appeared alongside the printed logo cranks. NOS Regina CXS Freewheel - NOS Regina CX Chain Relatively easy to find these 1/2 x 3/32 chains are almost always available and it takes a bit of searching to find the right freewheel. Bianchi Water Bottles - Bidons Rare and expensive, some inventive conjuring of search terms in different languages revealed some hidden gems at a sensible price. REG aluminium water bottle - Bidon Cages Again hard to find in NOS condition, then there's the sellers like our Swiss goat farmer who will only talk to locals. Eventually I found a seller in Germany who had a whole box load of REG cages and was happy to ship to far flung antipodean lands. All still sealed in their factory bags .... a bulk buy, now there's enough spare stock here for any X4 I'll ever own. Subtle Differences for Accuracy. We began the project with a frame that turned out to be a 1988 Bianchi X4 frame, by that year Bianchi had made some changes. 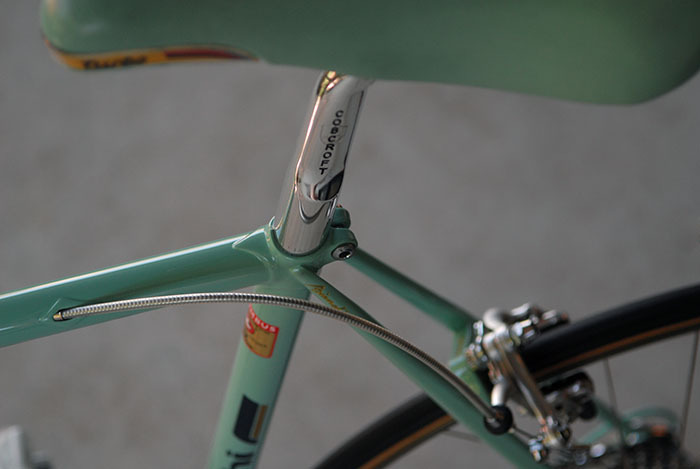 Some early Bianchi X4’s were produced with a “Square” seat stay bridge, the team bikes were supplied with these bridges. 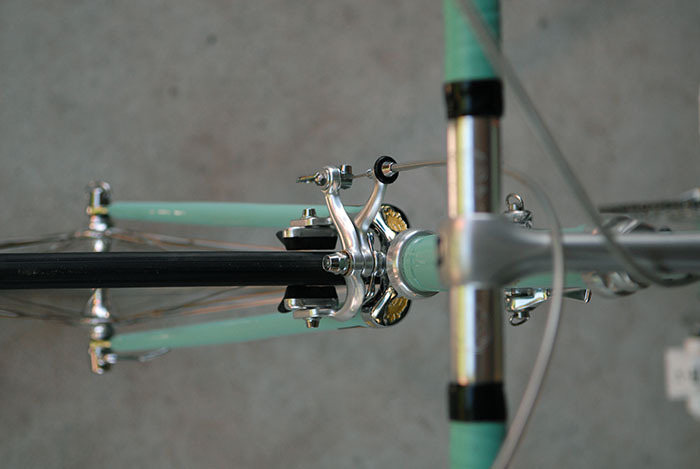 The bike we restored had a different Silva bridge style which is more common on later Bianchi X4 frames. Rear brake cable routing on the 1988 frame was internally routed, earlier frames were external. There’s a pump peg which we left intact, obviously this should not be on a team bike. Above the difference in the crank logo’s was mentioned, because of the difficulty and expense finding mint, early C Record crank sets, the ones fitted are 170mm, not 172.5 as the originals. The super expensive C Record rear derailleur is the two cut-out version, the original bike had the other cut-out type with one cut-out to the cage, but near impossible to find in NOS condition, so the next best thing was the double cut-out cage. Some of these details will be updated in the future if the correct components can be found. Final warning, digging up old dogs can be expensive, time consuming but extremely rewarding. One of the best and most fun projects I’ve ever undertaken. When you can get right up close, the end result is one stunning Bianchi X4 well worth every minute of work, suffice to say this is my favourite bike. If you’re anywhere near Brisbane this July, we’ll have this bike on display at the 2015 Pushies Galore. 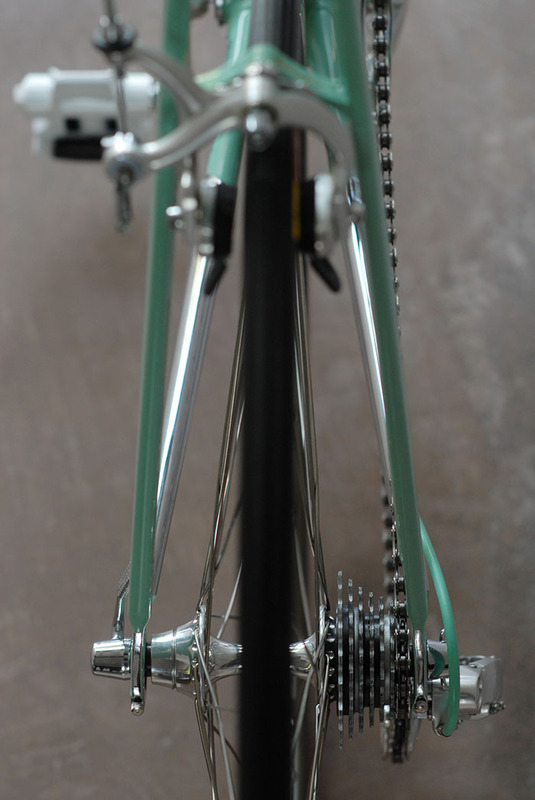 Celeste Bianchi X4 Two years of hard graft, re-finishing paint, chrome and components. Bianchi X4 engraved head badge - Edoardo Bianchi. 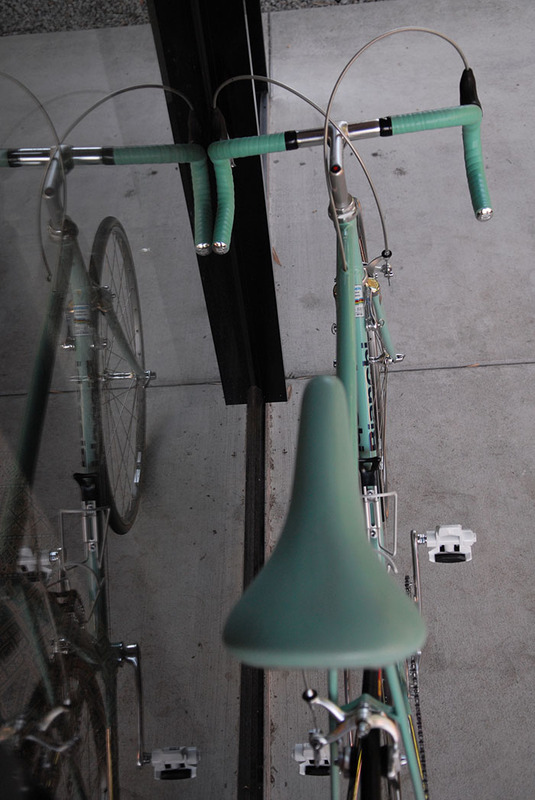 Bianchi celeste bars, saddle and frame. Every detail as close as possible to the 1987 Bianchi Piaggio team bike. Selle Italia Super Turbo saddle, covered in Bianchi celeste leather. 3ttt Record LA 84 stem, Europe to Australia and back again twice. Originally black, stripped the anodising, polished, pantographed, polished, anodised then painted. Team issue Ambrosio Bike Ribbon in Bianchi Celeste, finished with black electrical tape and 3ttt bar ends. Weinmann Carrera 400 brake cable, the grey Weinmann cables were used instead of Bianchi celeste. Bianchi pantographed LA 84 3ttt stem. In following years Bianchi made a switch from 3ttt to ITM for stem and bars. Selle Italia Super Turbo leather saddle. Re-covered in Bianchi celeste by Busyman. Bianchi cursive script, seat stay top eyes painted in with gold. 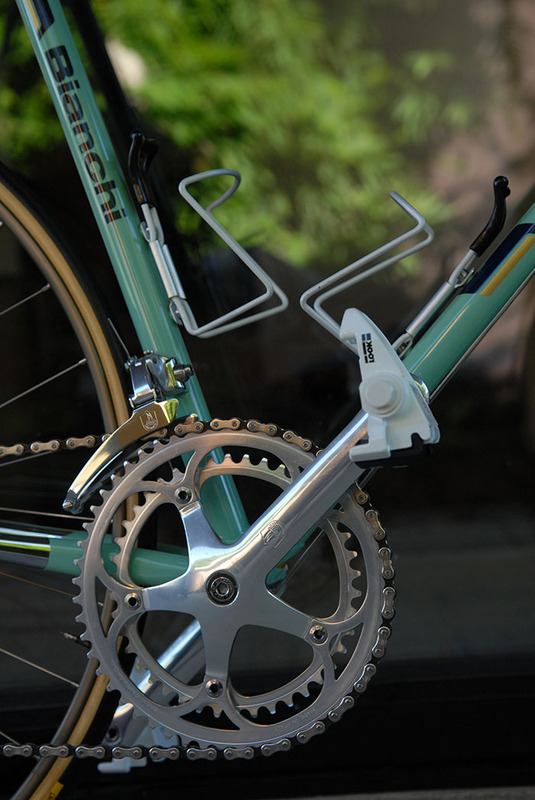 One of the features which makes the Bianchi X4 so sought after by bike collectors. Internally routed brake cables appeared in 1988, before that three top tube cable braze on's were used. We started this project knowing that Bianchi X4 frames were hard to find so followed through on the restoration of this frame, knowing it was one year too new. We never knew whether another frame could be found. There were three versions of the Gen 1 Campagnolo C Record rear derailleur. This rear mech is the third cage type with slots cutout in the top and the bottom of the cage. The other type had only the bottom part of the cage cutout and the most well known version had no cutouts. This cutout version is sometimes referred to as a Gen 1.5 Corsa Record rear mech. Campagnolo C Record front derailleur, Look PP 65 the original Look pedals, Campagnolo C Record crankset. Bianchi X4 bikes were usually fitted with Regina CX chains and Regina CXS freewheels. Campagnolo stamped shield logo, the highly sought after C Record gen 1 groupset. Some say this was the most beautiful groupset ever designed in the history of cycling. Team issue Clement Criterium tyres were standard, sometimes swapped for Vittoria CX. Regina CXS freewheel, 7 speed 12 - 18. Cogs were variously swapped for 19, 21, 23 and sometimes 26 depending on the terrain. Bianchi X4 pantographed Campagnolo C Record shift lever. After Moreno Argentin won the world championship road race at Colorado Springs in 1986, Bianchi X4's were shipped with the 1986 - 1987 World Champion decal. Hours of polishing went into the preparation of this Bianchi X4 fork crown for chrome plating. More hours of polishing these Bianchi X4 chain stays, to get a mirror finish ready for chrome plating. Campagnolo Corsa Record seat post, 27.2 was the standard size. These posts came in two lengths and the longer 180mm version was still too short for taller riders. 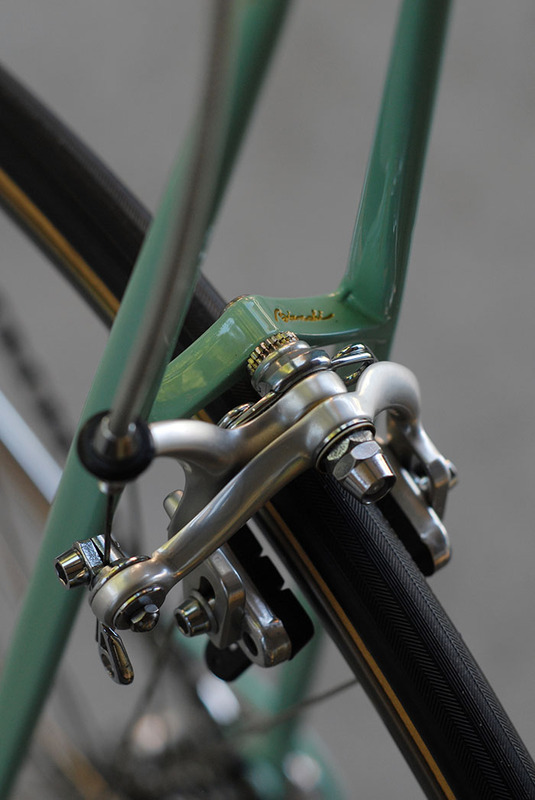 This silva brake bridge was standard on Bianchi X4's after 1987, many pre 1987 Bianchi X4's were built with a square bridge. Weinmann Carrera 400 rear brake calliper. Bianchi X4's were usually built with Columbus TSX, SLX or SPX. Campagnolo C record friction shift levers. Cobra and Mariplast supplied team issue water bottles. These cycling bidons came with various logos. This Cobra bidon has the G.S. Bianchi Piaggio logo with the Bianchi racing men design. This Bianchi cycling water bottle was available to consumers as well as pro team riders. Biciclette Bianchi - Prodotti Speciali Campagnolo, another variation of Bianchi cycling water bottles by Mariplast. Reg water bottle cages, alternatively Cobra and the French company TA Specialties all produced these lightweight race proven, dependable cages. Campagnolo C Record. Down tube shift levers have become a highly collectable item in recent years. Weinmann sponsored the GS Bianchi Piaggio team. Bikes were fitted with Weinmann Carrera rims and Weinmann Carrera 400 brake sets. No Cobalto's for these team bikes. 32 hole Campagnolo low flange C Record hubs, Alpina spokes. Columbus SL fork blades with Bianchi investment cast fork crown. Finding the right saddle proved to be difficult. From time to time these come up for sale, but usually in poor condition. A NOS Selle Italia Super Turbo was used and then re-covered for the complete NOS look. Campagnolo pantographed C Record seat post. We left the chrome intact on this Bianchi investment cast bottom bracket. 3ttt Competizione handlebars Tour de France bend - 44. With Ambrosio bike ribbon bar wrap. 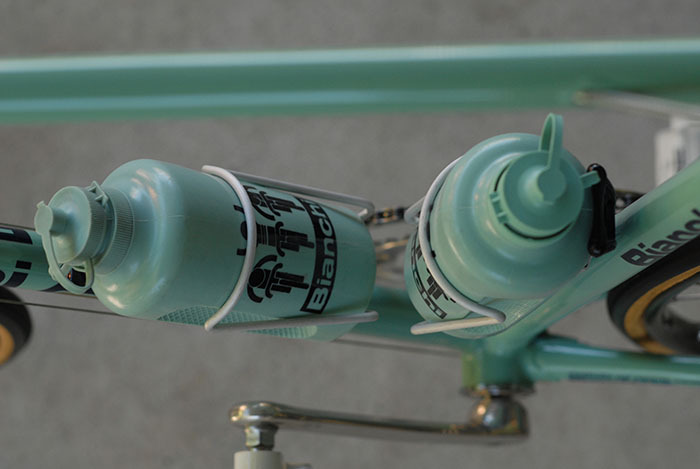 Bianchi celeste cable, found in the original suppliers packet from Rollag AG, the Swiss Bianchi importer in the early 1980's and principal sponsor of the G.S Bianchi Piaggio Swiss team. Bianchi rear mech cables were fitted in a very tight and short length, compared to today. Basic arrangement, one end ferule, a step down cable end stop and the outer is from a front brake cable, matched with a genuine Campagnolo inner gear cable. 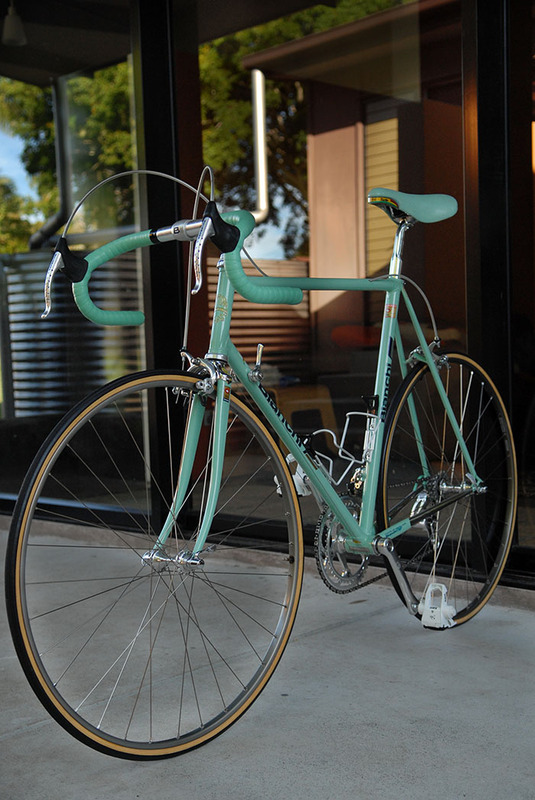 Bianchi celeste, getting the colour match right was difficult without reference to an original factory sample. We got pretty close in the end. When we were able to eventually compare the colour to an original bike we knew we'd nailed it. Another sought after detail, investment cast lugs bearing the mark of the Bianchi B.
Bianchi X4 fork crown gold detail. Campagnolo 53 T chain ring C Record. Campagnolo C Record front mech. Campagnolo C Record slotted cage rear mech, 1 Gen.
Campagnolo Corsa Record seat post 1 gen .
Campagnolo shield logo engraved Corsa Record. 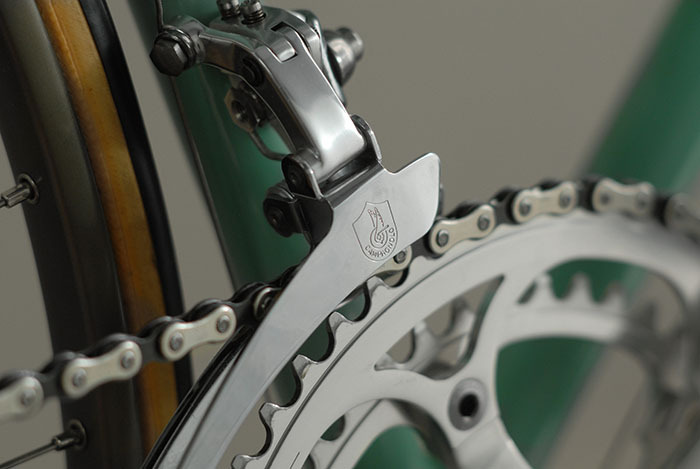 Edoardo Bianchi eagle crest head badge. By 1987 almost the entire peloton had made the transition to clipless pedals. These chunky Look PP65 white pedals had set the trend. Rear view Bianchi X4 drive train. Weinmann Carrera 400 brake lever. Weinmann Carrera 400 front brake calliper. Bianchi Piaggio Weinmann team bike. A new version, two years to complete and match the original 1987 race bike.